How do I know when to book? Because newborn sessions do get booked up well in advance, I would recommend to book while you are pregnant. Ideally book immediately after your 20 week scan as you will then know approximately when your baby will be born. 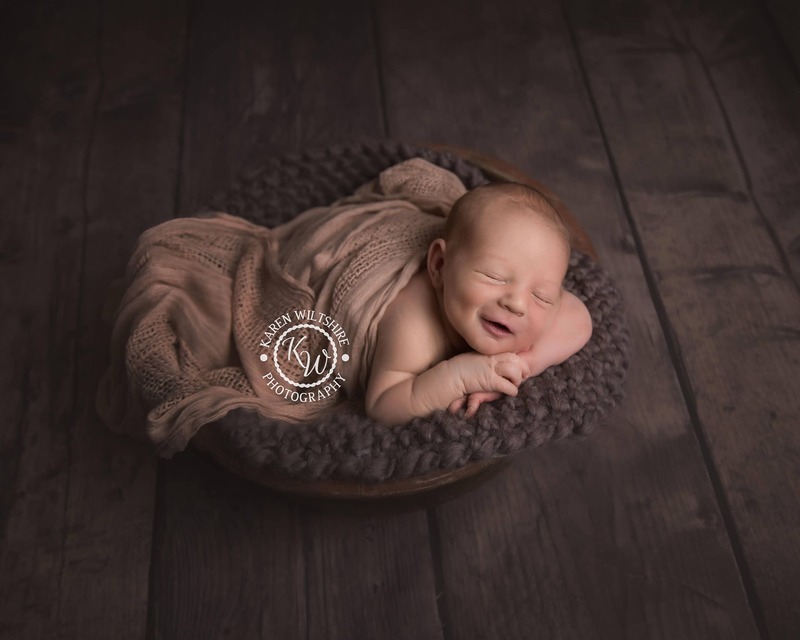 I usually suggest that photo sessions be scheduled 10 days after your due date since newborn photography is best done at about 7-12 days after the birth. However I know as a mum myself that this isn’t always possible, so I’m happy to aim to get sleepy newborn poses up to 8 weeks after the birth if required. My baby has been born already. Am I too late to book? You can still potentially book after your baby has arrived but newborn photography is best done before baby is two weeks old and you may not be able to secure the exact date you were hoping for. Please contact me as soon as possible to arrange your photoshoot, and I will do my best to fit you in. I can do newborn photography up to 8 weeks after the birth if required. If your bundle of joy is a little older please contact me to discuss you session and we may still get those sleepy photographs you dream of. What happens if I’ve reserved a date for my newborn photoshoot and then my baby arrives early/ late? Once a photoshoot is booked it can, of course, be moved to suit your baby’s arrival. Many babies arrive either earlier or later than planned, and I can reschedule bookings subject to my availability. Simply contact me as soon as possible to arrange an alternative date, giving as much notice as possible. How much does a newborn photo session cost? A newborn photography session, lasting approximately four hours, costs £60.00 and the photographs are available to buy in addition to this fee; either digitally or printed. Within this fee I professionally edit around 20-30 final images and then make them available to you to preview via a private online gallery or you can choose to return to my studio a couple of weeks after your photoshoot where I reveal the photographs in person, and help you choose which images to buy and have printed for your home. Yes, to secure the date of your photo session I require full payment of the session fee at the time of booking. This is currently £60 for a newborn session or £75 if booking a My First Year package. Fees may be paid by bank transfer, cash in person or by cheque. Session fees are transferable to an alternative date but are non-refundable. How long does a newborn photoshoot take? A newborn photography session will last approximately four hours, usually starting at 9am. It takes time to get those gorgeous sleepy curled up poses. What do I need to bring with me/us? As a newborn session can last for up to four hours, I would recommend you bringing everything you’re likely to need for you baby such as spare nappies and milk. Also don’t forget a snack to keep yourself going during the session. I offer tea and coffee making facilities in the studio and also have a changing mat and lots of baby wipes! Do you need to know in advance if the baby is a boy or girl? It is useful for me know whether your baby is a boy or a girl ahead of the photoshoot but it is not crucial. I have a wide variety of props, blankets and backgrounds and will choose from these to suit. In the instance of a cake smash photo shoot, typically done when a child turns one, it is more important that I know about the gender, and also the baby’s preferences as I can create shoots which can incorporate their favourite colours, characters or themes. What are the costs if I want to come back for another photo session as my baby grows? Because many parents love the photographs of their newborns, and decide to come back for further sessions during a baby’s first year, I have a dedicated package called ‘My First Year. A My First Year session costs £75.00 and includes the newborn sitting, plus two further follow on sessions within the baby’s first year, lasting up to one hour each. This package offers a substantial discount off my studio session fees and therefore is a very popular choice for many new parents. Then, as with the newborn photography package, around 20-30 final images are professionally edited and then made available to you to preview via a private online gallery. You may then select the images you wish to buy. You can either pre-book a My First Year session or decide to upgrade on the day of your newborn session. Can I bring my other children to the photoshoot? It is certainly possible to bring along any other children that you have, and I understand that you may wish to get photos of your newborn alongside their older sibling(s). Please do let me know in advance of the shoot if you plan to bring other children though so that I can plan the photoshoot accordingly and know whom to expect on the day. My husband’s really into sport. Can we bring a Rugby ball to include in the photos? Yes, if you have a personal prop that you would like me to incorporate into the photoshoot please do not hesitate to bring it along. I will do my best to get photographs that will include your own props, and in the past I have captured some wonderful, very personalised photographs doing exactly that. I’ve had clients bring in Rugby balls, rowing oars, guitars and even motorbike helmets. Should I feed my baby before the session? Please feed your baby as normal ahead of the session. We need the baby to be fed and happy, also ideally, tired so that we can hopefully get those adorable sleeping baby photographs that you want. A newborn session lasts up to four hours as a lot of time is required to settle the baby to sleep and move them into position to be photographed, so if the baby is fed and sleepy we can potentially obtain more photographs in the time available. Of course, most newborns require feeding at some point during their newborn session so remember to bring their milk, or feel free to breastfeed in my studio. Can I arrive early to feed/change/get baby settled? Yes, of course. If you would like to arrive earlier than the session start time please simply arrange this with me in advance. Do I need to/what can I do to help during the shoot? In some cases, I ask parents to sit close by to the baby as a safety precaution but usually the photoshoot is a time when you can actually kick-back and relax as I will soothe the baby and settle them into position ready for photographing. Most parents really enjoy watching the process and some even get the chance to have a short snooze!